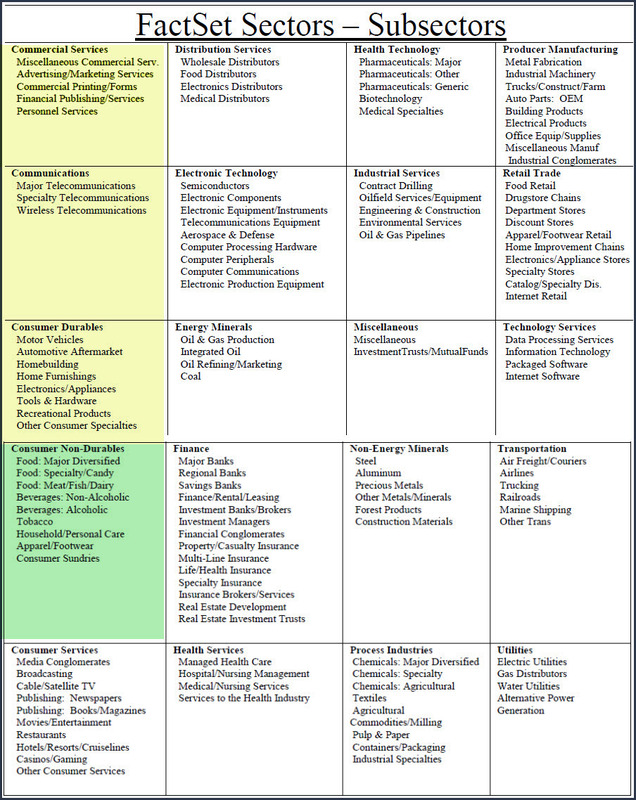 My primary objective with this series of articles (identifying attractively valued stocks in different sectors) is to provide the reader with a clear perspective of just how different individual stocks are and how different companies operating in different sectors are. It is my opinion and experience that investors worry far too much about what the general market may or may not do, and far too little about the specifics of the individual stocks that they actually own. The old saying that “knowledge is power” really comes to mind. When dealing with my own portfolio, or portfolios that I manage for others, my primary goal is to evaluate, assess and establish as clear as I possibly can an understanding of what each business in the portfolio is intrinsically worth based on fundamentals. This can be – and often is – in stark contrast to how the market may be valuing a given business in the short run. Stocks (and markets for that matter) do become overvalued, undervalued and fairly valued from time to time. However, when you know what your businesses are truly worth you are empowered and protected from making impulsive mistakes. This simply means that you are not foolish enough to sell a valuable asset for less than it’s worth. Conversely, nor are you foolish enough to hold onto an asset that is dangerously overvalued. In other words, when you know the value of your individual businesses, you are empowered towards making sound and prudent long-term investing decisions. Now there is a point of clarification that should be made here. Knowing the precise value of a business is not a practical notion. Instead, all that you can do is have a general but learned idea of what a business is worth. Stated differently, every investor can calculate their businesses’ worth within a reasonable range of prudence and understanding. The central idea here is that you understand your value well enough that you never sell a dollars’ worth of assets for $0.50 or vice versa. This is part 4 of a series where I have conducted a simple screening looking for value over the overall market based on industry classifications and subindustry classifications reported by FactSet Research Systems, Inc. In part 1 found here I covered the Consumer Services Sector. In part 2 found here I covered the Communication Sector. In part 3 found here I covered the Consumer Durables Sector and its many diverse subsectors. 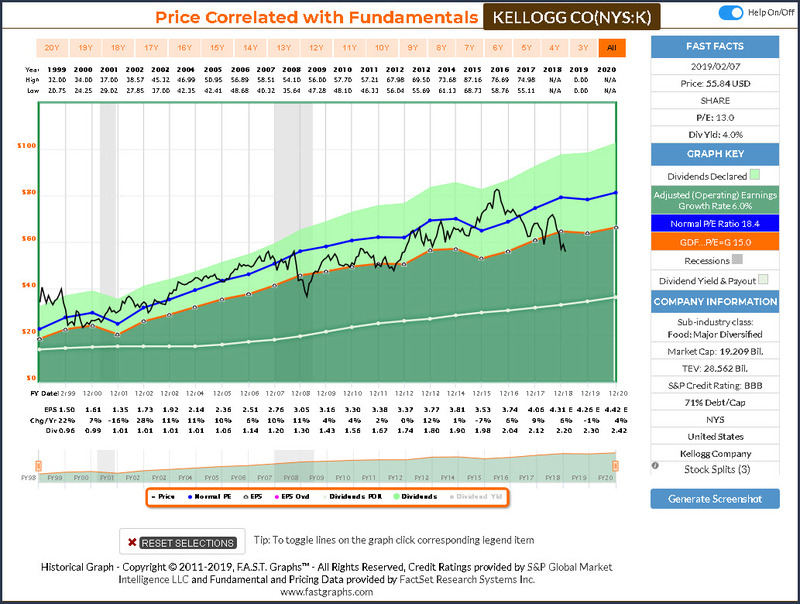 In contrast to the Consumer Durables Sector, the consumer Non-Durables Sector is comprised of companies with more consistent operating histories and more consistent records of dividend increases. Moreover, consumer non-durables are generally lower growth businesses with above-average dividend yields. Consequently, even though there are many well-known brands comprising this sector, very few produce long-term returns that are greater than the S&P 500 average long-term total returns. On the other hand, of the 403 Consumer Non-Durables companies many of the most recognized brands have significantly outperformed the S&P 500 on dividend yield and total dividends paid. Consequently, these companies tend to be favored for their above-average yield and steadily growing dividends over time. 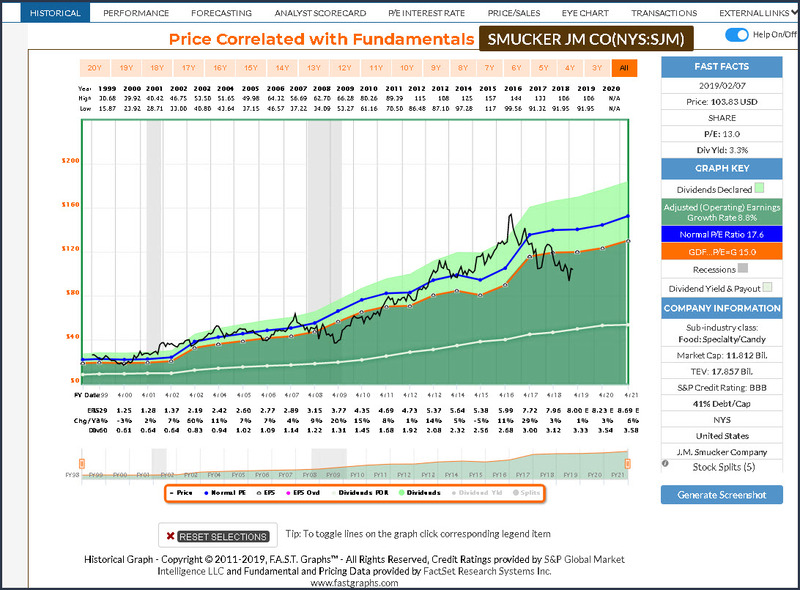 As I pointed out in part 2 of this series, there are many different reasons for investors to choose a given stock to include in their portfolios. Consumer Non-Durables tend to be well-known and highly respected companies that many investors are comfortable investing in. 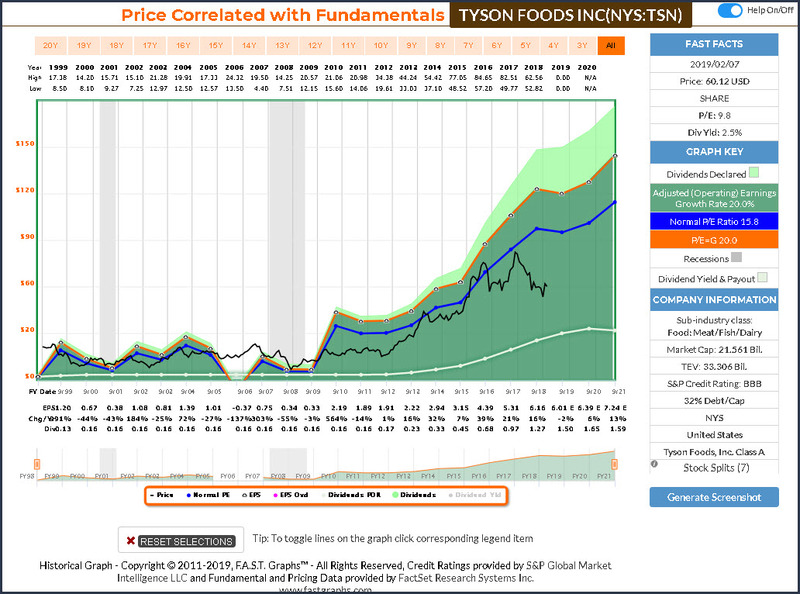 Moreover, as previously stated, they also tend to be favored for their dividend income. The following screenshots provide a quick look at each of the 11 candidates screened out of over 19,000 possibilities. However, there are only 403 companies categorized as Consumer Non-Durables, and these 11 were the only ones I was comfortable presenting in this article. I have placed them in order of highest dividend yield to lowest. 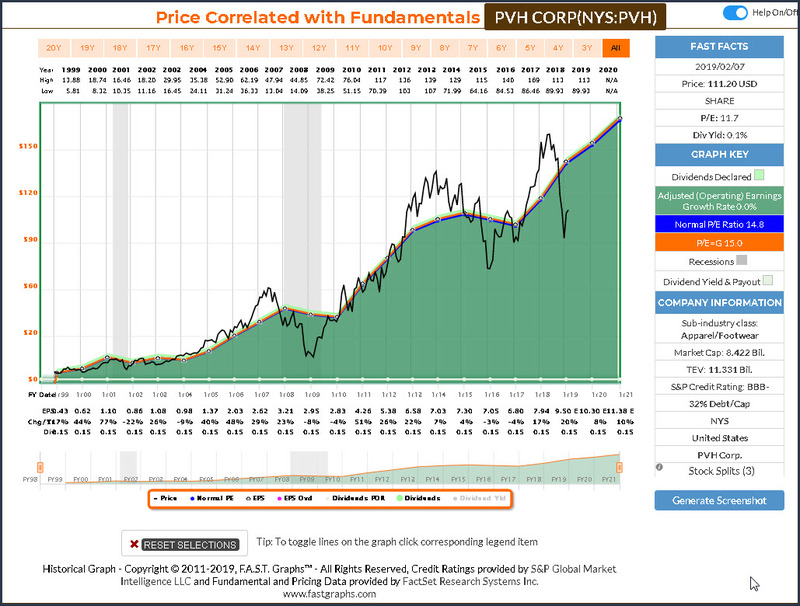 Additionally, the reader should note that one of these candidates, PVH Corporation, technically pays a dividend, but barely. The company descriptions are provided courtesy of the Wall Street Journal. In the FAST Graphs analyze out loud video that follows the screenshots, I will provide additional details and thoughts on the possible attractiveness as well as the potential negatives of each of these research candidates. 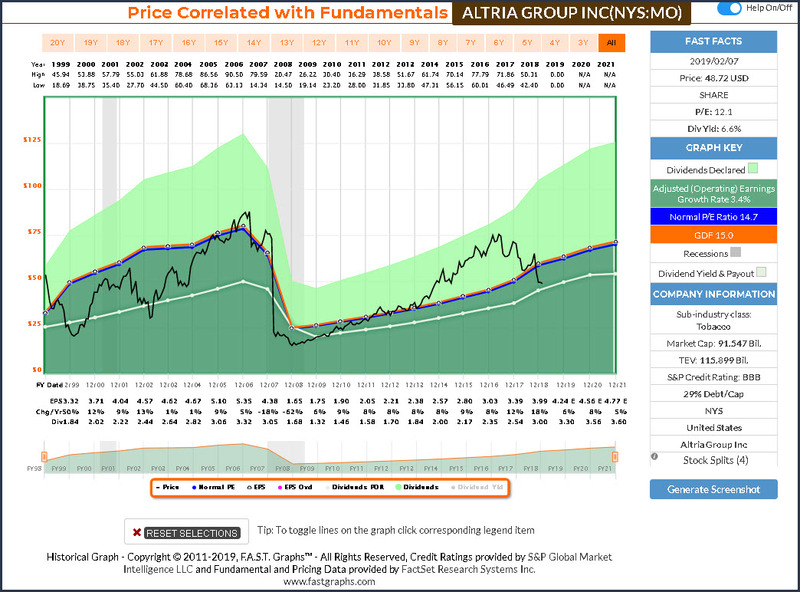 Altria Group, Inc. is a holding company which engages in the manufacture and sale of cigarettes in the United States. It operates through the following segments: Smokeable Products, Smokeless Products, and Wine. The Smokeable Products segment comprised of cigarettes manufactured and sold by PM USA and machine-made large cigars and pipe tobacco manufactured and sold by Middleton. The Smokeless products segment manufactured and sold by or on behalf of USSTC and PM USA. The Wine segment producer of Washington State wines, primarily Chateau Ste. Michelle and Columbia Crest, and owns wineries in or distributes wines from several other wine regions. 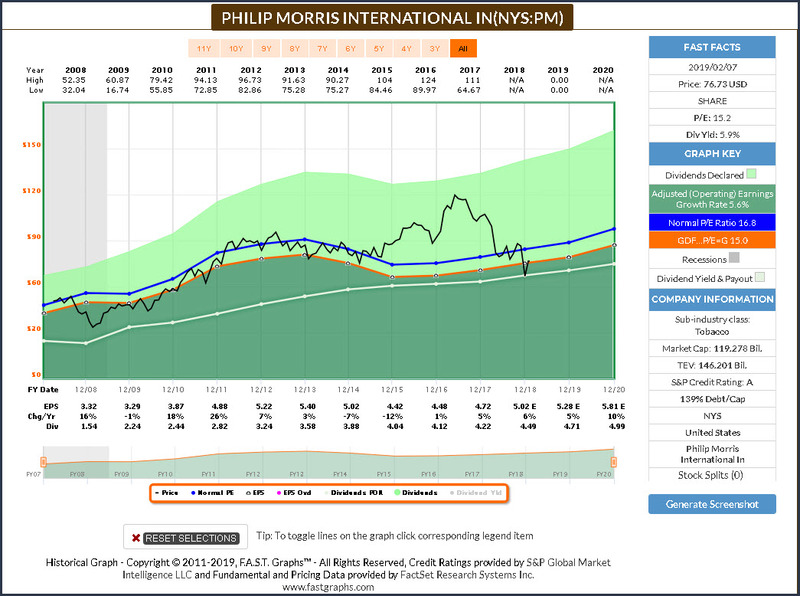 The company was founded in 1919 and is headquartered in Richmond, VA.
Philip Morris International, Inc. is a holding company, which engages in manufacturing and sale of cigarettes, tobacco and nicotine-containing products. It operates through the following geographical segments: European Union, Eastern Europe, Middles East & Africa, Asia and Latin America & Canada. The company was founded by Philip Morris in 1847 and is headquartered in New York, NY. 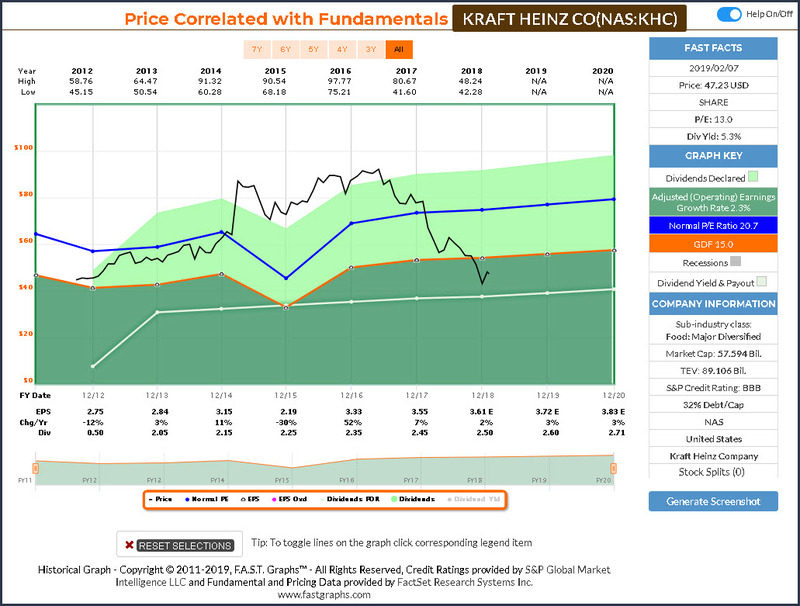 The Kraft Heinz Co. engages in the manufacture and market of food and beverage products. It operates through the following geographical segments: United States, Canada, EMEA, and Rest of the World. The Rest of the World segment is comprised of the Latin America and Asia Pacific segments. Its products include condiments and sauces, cheese and dairy, ambient meals, frozen and chilled meals, and for infant and nutrition. The company was founded on July 2, 2015 and is headquartered in Chicago, IL. General Mills, Inc. engages in the manufacture and marketing of branded consumer foods sold through retail stores. It operates through the following segments: North America Retail; Convenience Stores & Foodservice; Europe & Australia; and Asia & Latin America; and Pet. The North America Retail segment reflects business with a variety of grocery stores, mass merchandisers, membership stores, natural food chains, drug, dollar and discount chains, and e-commerce grocery providers. The Convenience Stores & Foodservice segment consists of ready-to-eat cereals, snacks, refrigerated yogurt, frozen meals, unbaked and fully baked frozen dough products, and baking mixes. The Europe & Australia segment refers to the retail and foodservice businesses in the greater Europe and Australian region, which includes yogurt, meal kits, super-premium ice cream, refrigerated and frozen dough products, shelf stable vegetables, grain snacks, and dessert and baking mixes. The Asia & Latin America segment encompasses the retail and foodservice businesses in the greater Asia and South America regions, which consist of premium ice cream and frozen desserts, refrigerated and frozen dough products, dessert and baking mixes, meal kits, salty and grain snacks, wellness beverages, and refrigerated yogurt. The Pet segment represents the pet food products sold primarily in the United States in specialty channels, including national pet superstore chains, regional pet store chains, neighborhood pet stores, and farm and feed stores; e-commerce retailers; military outlets; hardware stores; veterinary clinics and hospitals; and grocery and mass merchandisers. The company was founded by Cadwallader C. Washburn in 1866 and is headquartered in Minneapolis, MN. 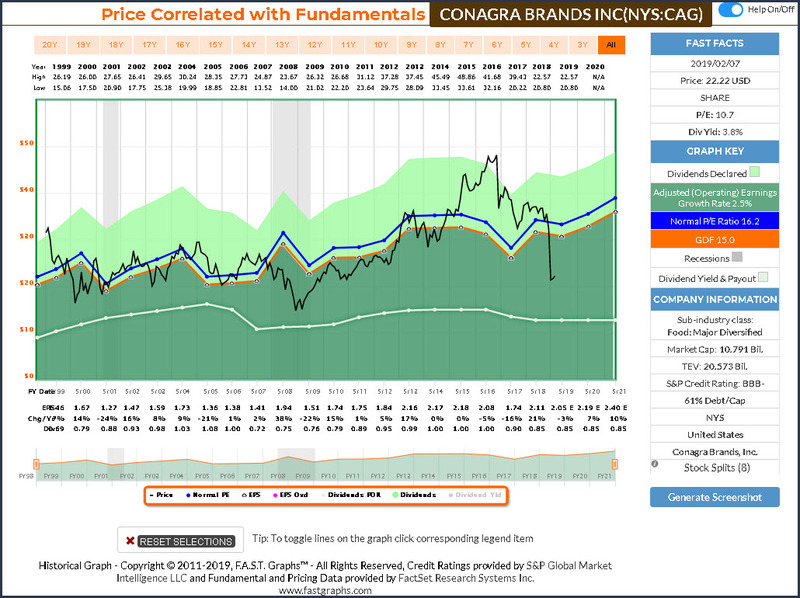 Conagra Brands, Inc. engages in the manufacture and sale of processed and packaged foods. It operates through the following segments: Grocery and Snacks; Refrigerated and Frozen; International; Foodservice; and Commercial Foods. The Grocery and Snacks segment includes branded, shelf stable food products sold in various retail channels in the United States. The Refrigerated and Frozen segment compries branded, temperature controlled food products sold in various retail channels in the United States. The International segment consists branded food products, in various temperature states, sold in various retail and foodservice channels outside of the United States. The Foodservice segment focuses in the branded and customized food products, including meals, entrees, sauces, and a variety of custom-manufactured culinary products packaged for sale to restaurants and other foodservice establishments in the United States. The Commercial Foods segment invoves in the commercially branded and private label food and ingredients, which are sold to commercial, restaurant, foodservice, food manufacturing, and industrial customers. The company was founded by Alva Kinney and Frank Little in 1919 and is headquartered in Chicago, IL. 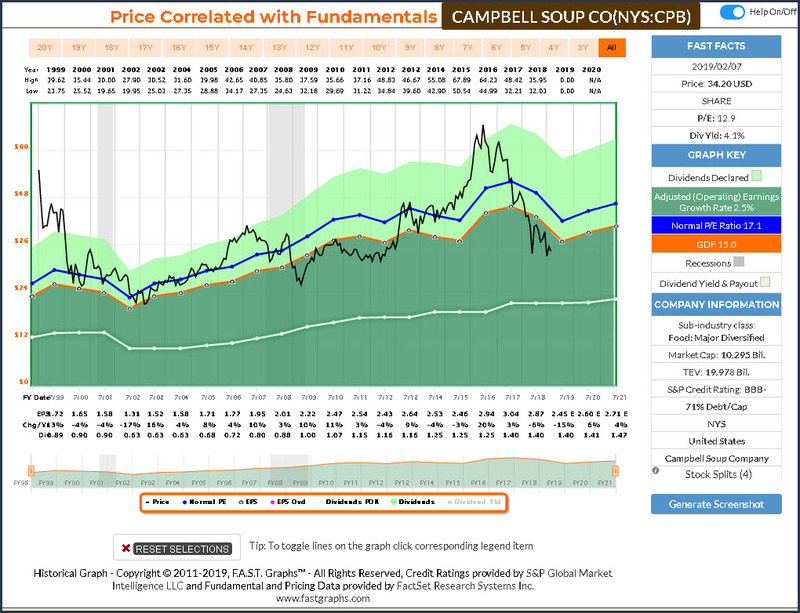 Campbell Soup Co. engages in manufacture and marketing of convenience food products such as soup, simple meals, snacks, and healthy beverages. It operates through the following segments: Americas Simple Meals and Beverages; Global Biscuits and Snacks; and Campbell Fresh. The Americas Simple Meals and Beverages segment includes the retail and food service businesses in the U.S., Canada and Latin America. The Global Biscuits and Snacks segment offers Pepperidge Farm cookies, crackers, bakery and frozen products in U.S. retail, Arnott’s biscuits in Australia and Asia Pacific, and Kelsen cookies globally. The Campbell Fresh segment consists of Bolthouse Farms fresh carrots, carrot ingredients, refrigerated beverages and refrigerated salad dressings, Garden Fresh Gourmet salsa, hummus, dips and tortilla chips, and the U.S. refrigerated soup business. The company was founded on November 23, 1922 and is headquartered in Camden, NJ. Kellogg Co. engages in the manufacturing, marketing, and distribution of cereal and convenience foods, including cookies, crackers, toaster pastries, cereal bars, frozen waffles, and meat alternatives. It operates through the following segments: U.S. Morning Foods, U.S. Snacks, U.S. Specialty, North America Other, Europe, Latin America, and Asia Pacific. The U.S. Morning Foods segment includes cereal, toaster pastries, health and wellness bars, and beverages. The U.S. Snacks segment offers cookies, crackers, cereal bars, savory snacks, and fruit-flavored snacks. The U.S. Specialty segment represents food away from home channels, including food service, convenience, vending, Girl Scouts, and food manufacturing. The North America Other segment includes U.S. Frozen, Kashi, and Canada operating segments. The Europe segment consists of European countries. The Latin America segment comprises of Central and South America and includes Mexico. The Asia Pacific segment composes of Sub-Saharan Africa, Australia, and Asian and Pacific markets. The company was founded by Will Keith Kellogg in 1906 and is headquartered in Battle Creek, MI. The J. M. Smucker Co. engages in the manufacture and marketing of branded food and beverage products. It operates through the following segments: U.S. Retail Coffee, U.S. Retail Consumer Foods, U.S. Retail Pet Foods, and International and Away From Home. The U. S. Retail Coffee segment includes the domestic sales of Folgers, Dunkin Donuts, and Cafe Bustelo branded coffee. The U.S. Retail Consumer Foods segment sells Jif, Smucker’s, Crisco, and Pillsbury branded products. he U.S. Retail Pet Foods comprises of Meow Mix, Milk-Bone, Natural Balance, Kibbles’n Bits, 9Lives, Pup-Peroni, and Nature’s Recipe branded products. The International and Foodservice segment covers the products distributed outside of the U.S. retail market. The company was founded by Jerome Monroe Smucker in 1897 and is headquartered in Orrville, OH. 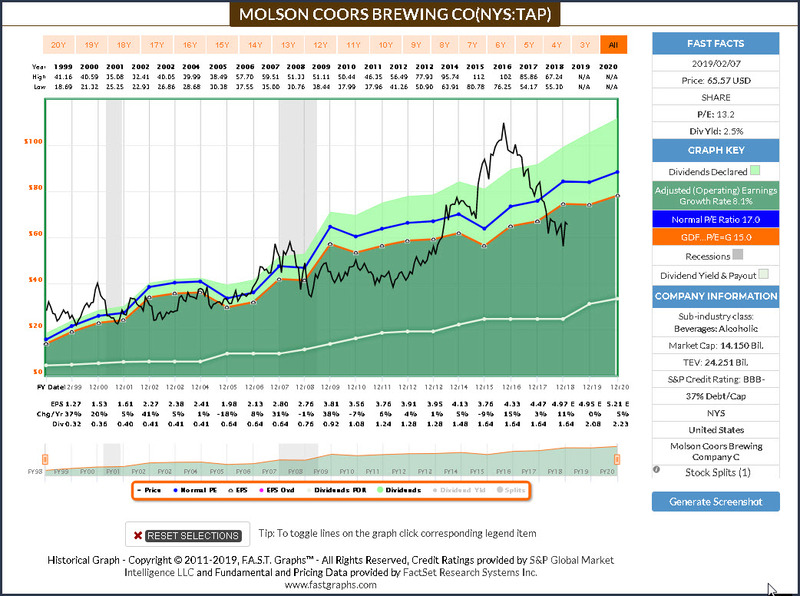 Molson Coors Brewing Co. is a holding company, which engages in the provision of beer. It operates through the following segments: United States, Canada, Europe, International, and Corporate. The United States segment consists of production, marketing and sales of its brands, and other owned and licensed brands in the United States. The Canada segment includes production, marketing and sales of its brands, and other owned and licensed brands in Canada. The Europe segment comprises of production, marketing and sales of its brands as well as a number of regional brands in the United Kingdom, Republic of Ireland, and Central Europe. The International segment focuses its operations on Latin America, Europe, Asia Pacific, and Africa. The Corporate segment represents interest and certain other general and administrative costs that are not allocated to any of the operating segments. The company was founded in 1873 and is headquartered in Denver, CO.
Tyson Foods, Inc. engages in the production of processed food. It operates through the following segments: Chicken, Beef, Pork, and Prepared Foods. The Chicken segment involves in domestic operations related to raising and processing live chickens into fresh, frozen, and value-added chicken products, as well as sales from allied products. The Beef segment includes operations related to processing live fed cattle and fabricating dressed beef carcasses into primal and sub-primal meat cuts and case-ready products. The Pork segment comprises operations related to processing live market hogs and fabricating pork carcasses into primal and sub-primal cuts and case-ready products. The Prepared Foods segment manufactures and markets frozen and refrigerated food products and logistic operations to move products through the supply chain. The company was founded by John W. Tyson in 1935 and is headquartered in Springdale, AR. PVH Corp. engages in the design and marketing of branded dress shirts, neckwear, sportswear, jeanswear, intimate apparel, swim products, handbags, footwear, and other related products. It operates through the following segments: Calvin Klein North America, Calvin Klein International, Tommy Hilfiger North America, Tommy Hilfiger International, Heritage Brands Wholesale, and Heritage Brands Retail. The Calvin Klein North America and Calvin Klein International segments operates in North America; and Europe, Asia, and Brazil respectively. It sells its products under the brand names CALVIN KLEIN 205 W39 NYC, CK Calvin Klein, and CALVIN KLEIN. The Tommy Hilfiger North America and Tommy Hilfiger International segments wholesales in North America; and Europe and China respectively. It consists of Tommy Hilfiger, Hilfiger Denim, Hilfiger Collection, and Tommy Hilfiger Tailored brands. The Heritage Brands Wholesale segment markets its products to department, chain, and specialty stores, digital commerce sites operated by select wholesale partners and pure play digital commerce retailers in North America. The Heritage Brands Retail segment manages retail stores, primarily located in outlet centers throughout the United States and Canada. The company was founded in 1881 and is headquartered in New York, NY. As an over-generalization, Consumer Non-Durables are products that tend to be purchased repeatedly over short periods of time. This short repeat sales cycle tends to produce a level of stability and consistency. However, it also comes with a price. Typically, companies in the Consumer Non-Durables Sector are not high growth opportunities. Instead, and for the most part, they can best be thought of as stable income producers. Of course, there are exceptions. Consequently, I would argue that there is a place in most everyone’s portfolio for a high-quality income-producing Consumer Non-Durable investment. The quality consumer non-durable investment can help diversify and even stabilize a portfolio. On the other hand, investments in this sector are not likely to be producing the highest total returns in your portfolio. Nevertheless, they can make sense for a portion of your portfolio. Disclosure: Long MO, PM, KHC, GIS. 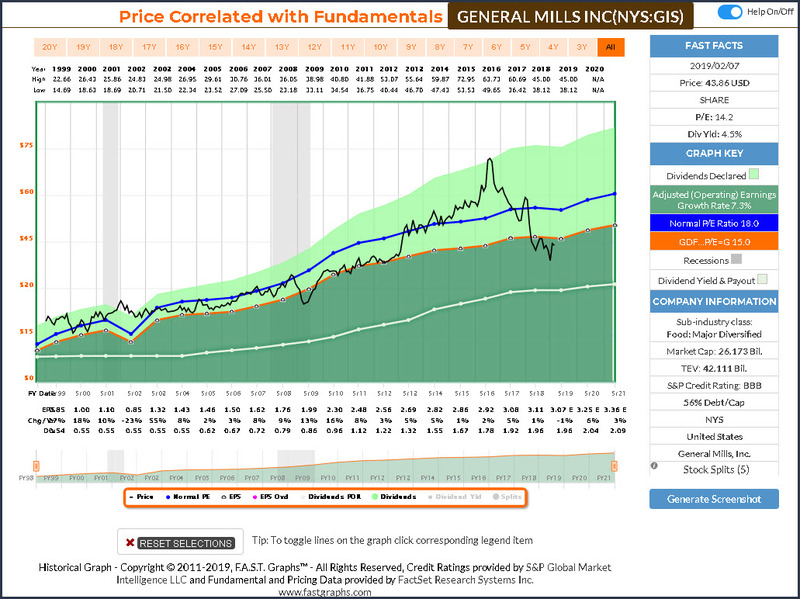 This entry was posted in Research Articles and tagged Altria, Campbell Soup, Carnevale, Conagra, Consumer Non-Durable, FAST Graphs, fundamentals, General Mills, investing, Kellogg, Kraft, Molson, Philip Morris, PVH, retirement, Smucker, stocks, Tyson. Bookmark the permalink.